Warm, slightly sweet; best served toasted and generously spread with melting margarine, and a good hot cup of tea. This recipe came into being when I was making almond bread and accidentally used sweet vanilla almond milk instead of the required unsweetened plain almond milk, so I had to add more sugar and fruit and nuts. A girl’s gotta do what a girl’s gotta do ….. and daughter #2 took this on board, and ate over half the loaf that evening, presumably to prevent me from getting fat! Sweetheart. For Bara Brith (a Welsh bread), substitute more dried fruit/ candied peel for the nuts, and soak them in tea for at least 1/2 an hour before using. 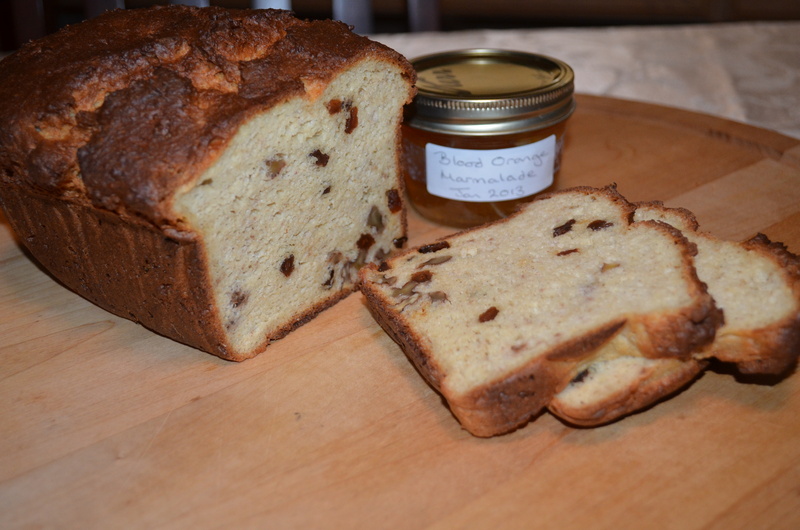 Shown here with the minimal raisins and walnuts suggested in the recipe. Stir the raisins and walnuts into the batter. Turn the mixture into a medium loaf pan lined with parchment paper. Leave to rise for about 30 minutes. Cook for 60 minutes in the middle of the oven at 360F, lightly covered with tin foil to prevent over browning. Allow to cool before slicing. This is particularly good toasted and smothered with melted margarine, accompanying a piping hot cup of tea. I’ve been cooking up quite a few things this week, but I’ve failed to get them on to the blog, yet. Quite a bit of time was taken up making blood orange marmalade (it being that time of year). 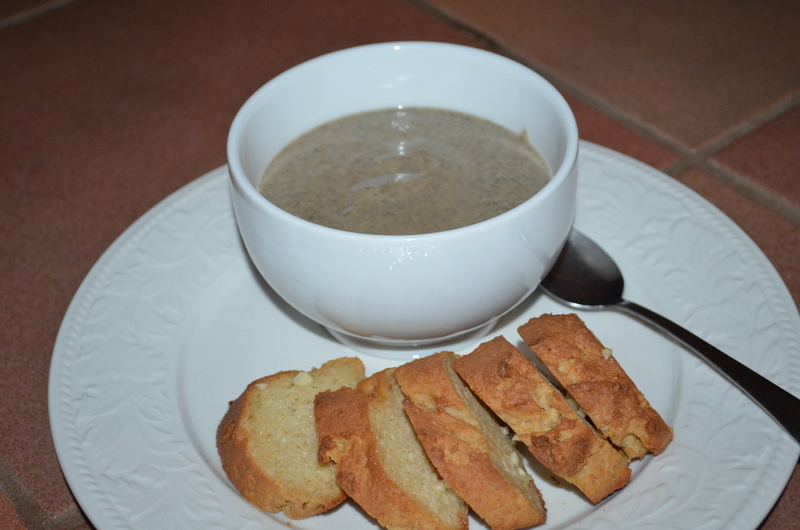 Marmalade making can be quite time consuming, so lunch today was a quick to make, warming mushroom soup. Elegant if presented as such, I’ve been making this soup for years, now. The cashews were a recent substitution for the dairy free cream cheese, as I think they have a better nutritional profile, and they do add body as well as richness to the soup. However, for a less calorific version, use cooking oil spray instead of the margarine or olive oil; use vegan cream cheese instead of the cashews (mine has 90kcals/oz); and use water instead of the non-dairy milk for a total recipe calorie count of 648kcals which is 100kcals per 8floz, or 162kcals per serving. 1 tbsp dried thyme (2 tbsp of fresh thyme) – don’t stint on this. Heat the margarine in a large pan and sauté the onion until transparent. Add the mushrooms and sprinkle on half a tsp of the salt to help release the juices. Once the mushrooms have turned a darker color and softened, add the potato, the herbs, 16 fl oz (2 cups) of water, and the cashews (if using); bring to the boil, cover and cook until the potatoes are cooked (at least 10 minutes). Add the vegan cream cheez (if not using cashews) and 16 fl oz non-dairy milk (or water), and blend as briefly as possible, but long enough to ensure the cashews have blended into a smooth soup. Adjust consistency with more water, as desired. Add salt and pepper to taste, serve hot. These patties are not the sort to put in a burger bun. They have a mild flavor, an interesting ‘skin’, and a creamy internal texture. Try adding the sea weed (nori), if you want to get a mild marine flavor, and serve with tartar sauce. I’ve also made them without the nori, and served them up with a thick mushroom sauce made by reducing the water in rich mushroom soup. The girls both liked these served up with oven chips and tartar sauce. Note that freezing the tofu alters the texture, so you might not want to do that. Quinoa Tofu Burgers with dairy free tartar sauce and oven fries. Place the dried mushrooms into a large mug with the cashews on top (to keep the mushrooms from floating) and pour enough boiling water over the top to cover. Leave to soak for 1/2 hour. Melt the margarine in a large frying pan over a medium heat, and gently sauté the onion until lightly browned (~5-10 minutes). Finely chop the garlic cloves, and add to the onion. Drain the mushrooms and cashews, then put them into the food processor and pulse until a coarse paste has been formed. Drain the tofu, then squeeze between two plates, tilting them over a sink to drain off excess moisture. Add the tofu, nori (if using), Braggs, garlic powder, onion powder, 1/2 the onions, and a dash of black pepper to the food processor. Briefly combine. The mixture should not be smooth at this point; it should have a consistency much like cooked quinoa: not too lumpy, and not too smooth. By hand, stir in the remaining cooked onion and the quinoa. Divide the mixture into 8 even sized pieces and form each into patties. Tip the cornmeal into a bowl or onto a work surface, and dredge each of the patties in it. Heat the oil in a large frying pan, and fry the patties (four at a time) until golden brown on each side. Orange season is just starting here. The oranges are still quite tart, but that just makes them quite exciting to eat, and great for making marmalade. I was ambling through my list of developing recipes on my computer, looking for recipes with oranges in them for lunch, when I came across this salad. 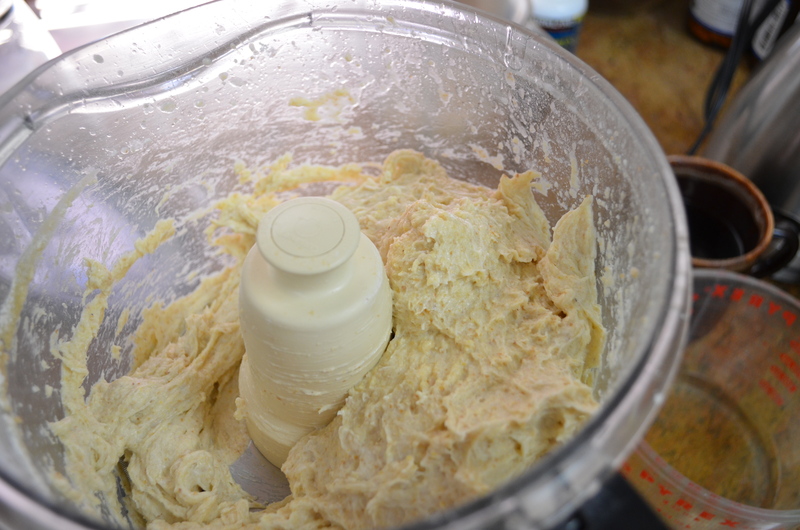 Last year when I’d made it, I’d used mayonnaise made the traditional way (i.e. it was an emulsion), and the dressing never lasted very long before turning from a thick, rich, topping, to a thin liquid in the bottom of the salad bowl. I was pretty sure that the inclusions were breaking down the mayonnaise’s emulsion, so today I tried the dressing with tofu mayonnaise (with no emulsion to destroy). I shall endeavor to rid myself of the smug feeling as soon as possible, and get the recipe for the tofu mayonnaise on the blog. Lightly steam the broccoli florets in salted water such that they still retain some of their crunch (1 – 2 minutes). Leave to drain thoroughly in a colander. If you don’t, the dressing will go thin. Juice two of the oranges and boil the juice until reduced to 1/4 of original volume and syrupy. Stir the reduced orange juice into the mayonnaise, and check flavor. Add sugar if needed. Peel the remaining oranges and cut the flesh into 3/4” chunks. 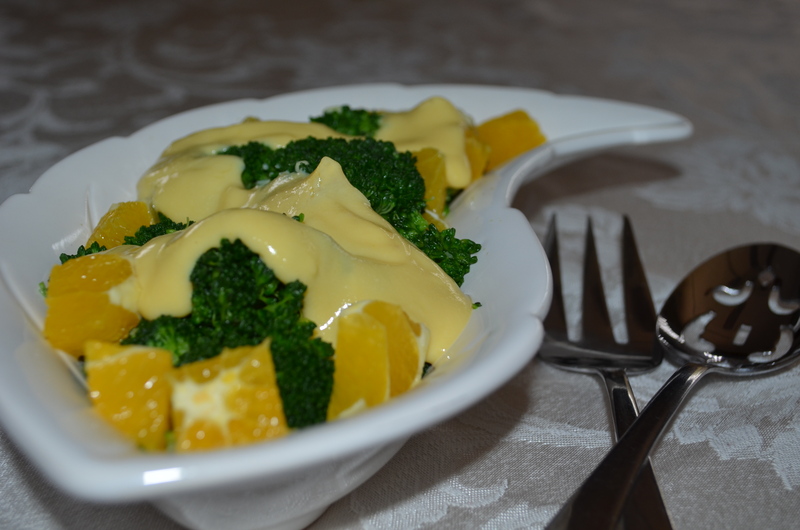 Mix the broccoli and orange chunks together, and drizzle the orange mayonnaise over the top. 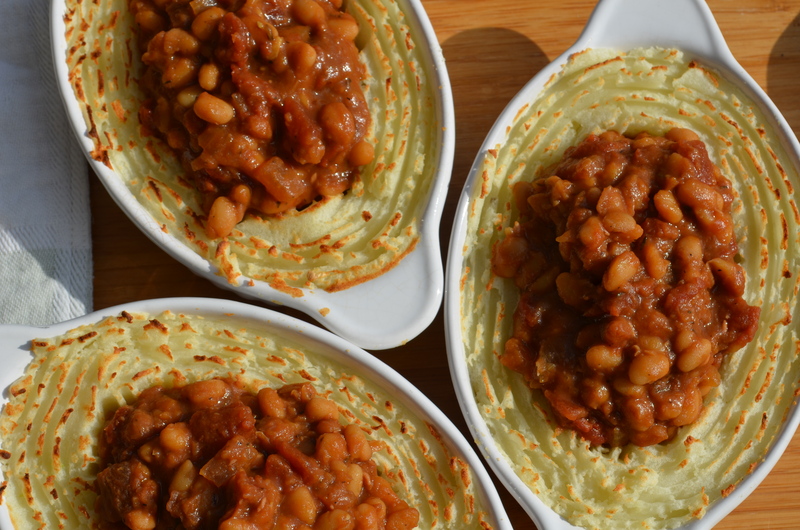 Boston Baked Beans served in a bowl of garlic mashed potatoes. When thinking about gluten free diets, the temptation is to focus on replacements for bread, pasta, cakes, and such like, so when I include naturally gluten free foods in the blog, I sometimes feel a bit sheepish. However, I’ve been making Boston Baked Beans for far longer than I’ve been interested in making gluten free bread, because they’re such a good staple, and they are gluten free, so I hope you enjoy them! 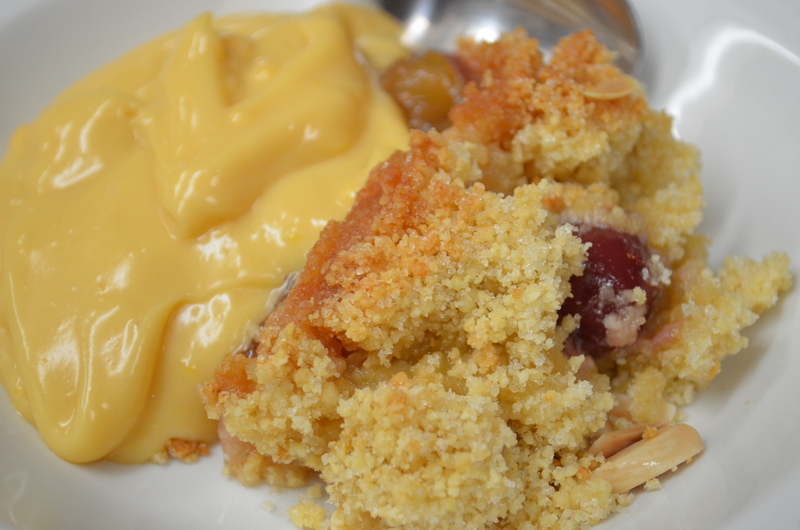 In actual fact, I’ve included two recipes, below. For Boston Baked Beans, the sauce is chunky. For regular baked beans, blend the sauce with some non-dairy cream cheez until completely smooth before adding to the beans. If you’re not used to cooking beans from scratch, don’t get fazed. It’s really straight-forward: Clean the beans. Soak the beans. Cook the beans. Add the beans to the other ingredients. Most of the time is spent doing other things while the beans do their thing under water. Check the beans over for debris and damaged beans to be discarded, then rinse them. 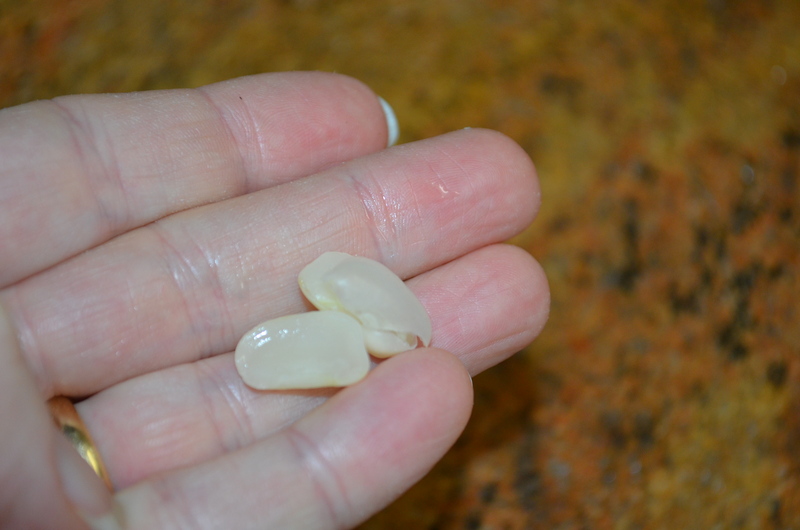 Put the beans in a pressure cooker pan or large saucepan, with water to cover them by about 2 inches; bring to the boil; turn off the heat; cover, and leave to soak for an hour or until a bean can be split in half with your finger nail, and appears to be the same color all the way through. Return the beans to the pot with enough clean water to cover by about 1/2”. If you don’t use a pressure cooker, you’ll need to add more water either at the beginning, or as the cooking continues. Aim to have the water remain above the level of the beans throughout the whole process. In a pressure cooker, bring the beans up to pressure, turn off the heat, leaving the pan in place, and allow to come down from pressure naturally. If you’re just boiling the beans in a regular pan, cover with a tight fitting lid, and simmer for about an hour (this may be more depending on how old the dried beans are), checking the water level once in a while. Cook beans until tender but not disintegrating. They won’t soften further after the addition of the other ingredients, no matter how long you boil. Any slight crunch will be obvious, and the beans won’t be a pleasure to eat, so taste one to check! If you’re using the pressure cooker, just boil the beans conventionally, if they’re still not quite soft enough when they come down from pressure. Add the garlic to the onion, and warm through for a minute before adding all the other ingredients (except the beans). If making standard baked beans, now put all the sauce ingredients into the food processor (or use an immersion blender) and blend. 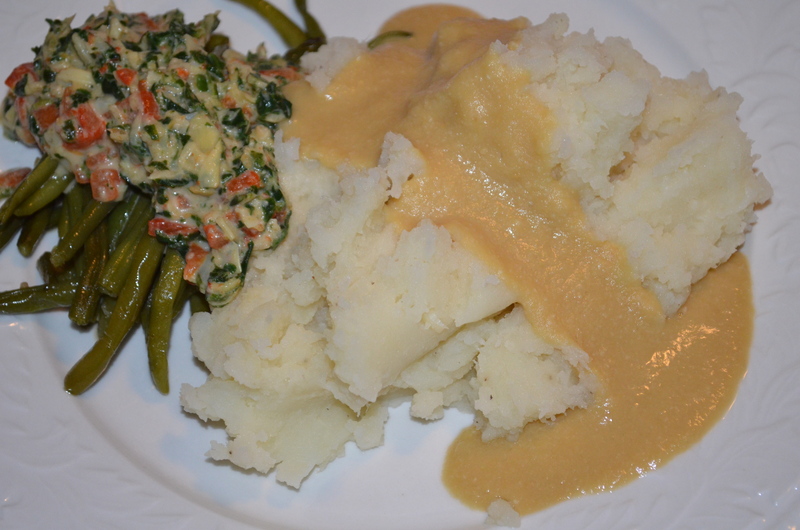 Pass the sauce through a sieve or chinois, if available, but you can skip this step, if not. For both kinds of beans: Drain the beans; add the sauce to beans, and simmer for 30 minutes until the beans have taken up the flavor and color. 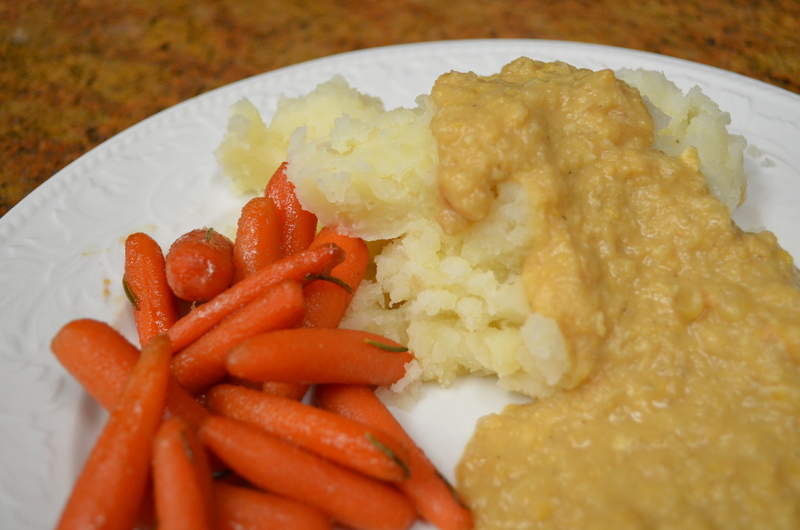 Serve hot with baked potatoes, or on almond bread toast, or under a cobbler topping.